Things are just not working out for the Super Sons. The heroes, not the comic itself. Things are working out great for the book, which has another really fun issue. Scott Godlewski steps in to handle the art, and does a commendable job. I have to admit, at first I didn’t even notice the change in artist, though once I did it becomes obvious. But Godlewksi is just as good at capturing the spirit of the book. 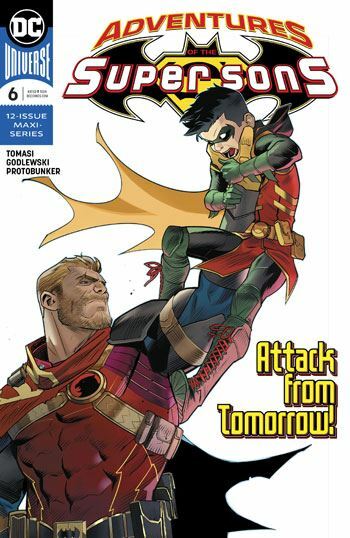 Tommy Tomorrow, DC’s first major science fiction hero, makes a return in this issue. He looks like he has been through some rough times. I like that he is wearing the remains of Superman’s cape, Batman’s utility belt, and Hawkman’s straps. Those accoutrements are not put to use in this issue, so I expect they will be utilized later on. The story also brings back an obscure character, one I was certain would never be seen again, the Hukka. This creature, accurately described in this story as a sort of monkey-dog, appeared in a book called Atari Force. Just the fact that the book was called Atari Force should be enough to let you know it came out many, many years ago. But the Hukka always was resilient, so I guess I shouldn’t be surprised that it survived so many years in comic book limbo. The actual story for this issue is pretty low key, although the villains do show up before it’s over, and Superboy and Robin are in a very bad situation at the climax of the tale. As always, lots of fun to read.